As "the next best thing to seeing The Beatles!" (Associated Press), RAIN performs the full range of The Beatles' discography live onstage, including the most complex and challenging songs that The Beatles themselves recorded in the studio but never performed for an audience. In addition to the updated sets that include brand new LED, High-Definition screens and multimedia content, new songs have also been included with the launch of the 2013-14 Tour. Together longer than The Beatles, RAIN has mastered every song, gesture and nuance of the legendary foursome, delivering a totally live, note-for-note performance that's as infectious as it is transporting. From the early hits to later classics ("I Want To Hold Your Hand," "Hard Day's Night," "Sgt. Pepper's Lonely Hearts Club Band," "Let It Be," "Come Together," "Hey Jude" and more), this adoring tribute will take you back to a time when all you needed was love, and a little help from your friends! "...Ironically, Broadway in Chicago's touring retrospective has been together longer than the Beatles ever were, a testament to the persistence of fame even in tribute form. No question, this is accuracy itself, except for the fact that it's being done in 2017 for almost three generations more than could have seen the originals. But there's nothing like making up for lost time." "...Although “RAIN: A Tribute to the Beatles” has played in Chicago several times, for one reason or another, I’d never seen it. I never knew what I was missing! 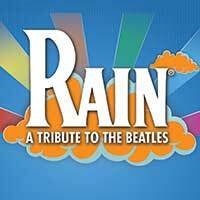 “RAIN” is not a jukebox musical created around the Beatles’ music, it is an actual concert! People (including me!) were dancing in their seats, until “Twist and Shout”, when everyone stood up and danced!" "...The excitement in the audience is palpable as the stage at the Oriental Theater hosts a scrim with images relating to the Beatles - there's Shea Stadium, an Abbey Road street sign, and a peace symbol. The lights dim and a video starts playing with newspaper clips of Beatles headlines accompanied by screaming fans. For some, seeing RAIN is a chance to remember the years of the British Invasion. For others, the show is a chance to experience the Beatles because they weren't around the first time. Whichever category you may fall into, RAIN is a fantastic reenactment of some of the Beatles greatest hits."